A GISP is a certified Geographic Information Systems Professional who has met the minimum standards for ethical conduct and professional practice as established by the GIS Certification Institute (GISCI). GISCI certification requires achievement in three areas: educational achievement, professional experience, and contributions to the profession. MAGIP supports members in their achievement of GISP certification (and GISP Renewal) by providing a letter of support listing your personal involvement MAGIP Community to be submitted with your GISP application. You can also use the request for assistance form to ask for assistance in reviewing your application. MAGIP also provides GISP application review services at their annual Big Sky GeoCon. Fill out the Request for Assistance form to receive this member benefit! 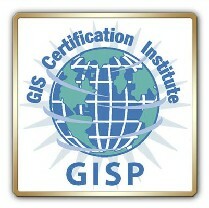 MAGIP endorsed the GISP Certification in the spring of 2009. MLIAC followed suit in 2009. For a more information view Kris Larson's Presentation from the 2012 Technical Session. Or, contact MAGIP for additional information.